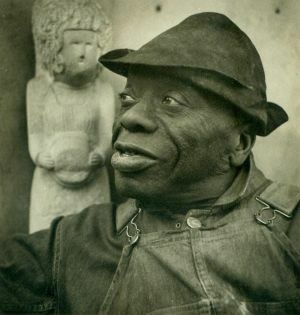 William Edmondson was the first black artist to have a solo show at the Museum of Modern Art (MOMA), New York in 1937. He grew up near Nashville, Tennessee. Edmondson’s father, George, died when he was quite young and his mother Jane became a farm worker to support the family. With a belief that his work was inspired by God, Edmondson began carving tombstones and later expanded his work to include sports heroes, animals, birdbaths, and figures from the Bible. Edmondson had very little formal education and as a young man he worked for railway shops in Nashville, Chattanooga, and St. Louis. He was also employed at various times as a farmhand, horse groom, orderly, fireman and handy man. When Edmondson began work as the helper for a stonemason, he discovered his talent for stone carving and built his own carving tools by forging railroad spikes. In the early 1930s during the Depression, he began carving tombstones for Nashville’s black community using pieces of limestone that had been thrown away. With the sound of Edmondson’s hammer ringing in the neighborhood, people stopped by and bought tombstones for a few dollars. Edmondson never married. A very religious man, Edmondson believed that God guided his creative endeavors and the subject matter reflected his faith. In one example, he created Martha and Mary, a sculpture based on these prominent Biblical figures. Eventually his fame spread beyond Nashville because his sculpture was displayed in 1937 at his first one-person exhibition at MOMA. At the end of the exhibit it was sold to a prominent collector. From that point his work was recognized in national art circles. On several occasions, Edmondson said he was not concerned about the sale of his work because he was doing the carvings for God. Although he spent the majority of his life in Nashville, Edmondson connected with Harlem Renaissance artist Aaron Douglas and writer James Weldon Johnson in a discussion about art and ideas. Edmondson worked as an artist on Works Progress Administration (WPA) projects in Nashville from 1939-1941. In addition to his MOMA show in New York, Edmondson had solo shows at The Montclair Art Museum (New Jersey) and The Cheekwood Fine Arts Center, The Nashville Artist Guild, and The Tennessee State Museum (all in Nashville, Tennessee). His work was included in group exhibitions in Washington, D.C., New York, San Francisco, and Paris, France. Edmondson’s work is in the permanent collections of The Montclair Art Museum (New Jersey), The University of Rochester (New York), the San Francisco Museum of Art, and in Washington, D.C. at The Hirshhorn Museum and Sculpture Garden, The National Museum of American Art and the Smithsonian Institution. William Edmondson died in Nashville in 1951 of a heart attack. He was around 81 at the time of his death.